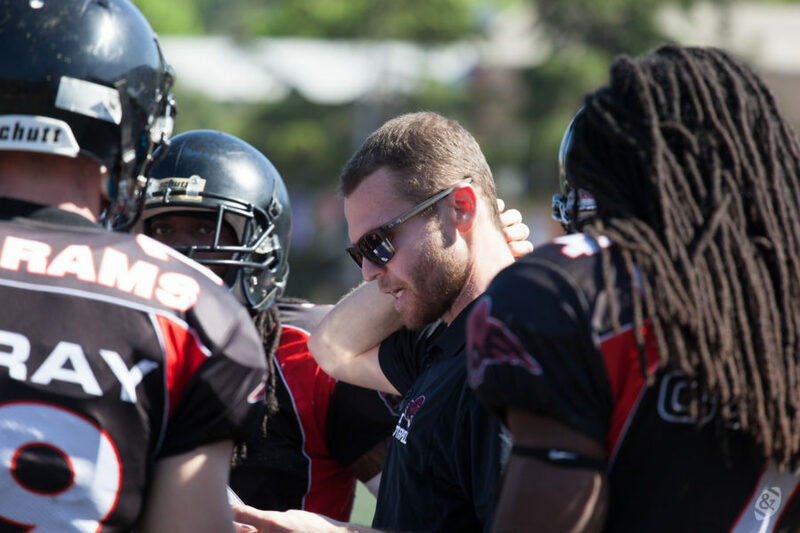 Brett Morgan, head coach of sensational «Istanbul Koc Rams» team told First & Goal about his work in Brasil, Turkey and Canada, the role of General Manager and his passion about quarterbacks. – How did you get involved with Turkish football? – Last March I came over with a group of college and professional coaches from the United States with an organization called FCI. – Was it the event with Marshawn Lynch? – No, it’s a different group. Our group did a collection of camps and clinics in Istanbul, Italy and Mexico. We came and partnered with Kasey Crosby, who now coaches with me here (that’s how I met Kasey initially). It was a great camp, I had a great time in Istanbul. I came back to my coaching career in the US, but over time this organization [Koç University] kept contacting Kasey and he was in touch with me. They continued to gauge my interest and expressed the things they’re trying to do. The conversations escalated, we kept in contact and the more I learned about Koc, the more interesting it became to me. It took off from there. – Is it a university team? 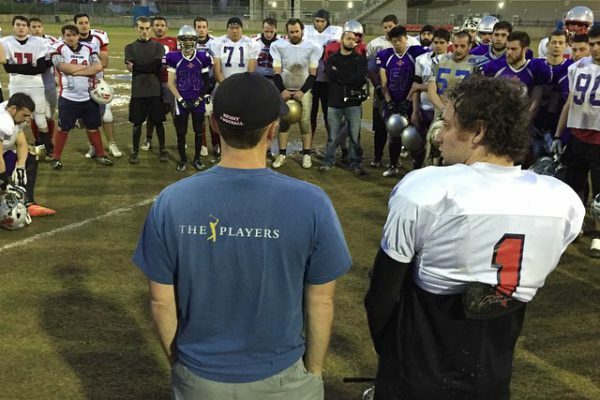 – Koc has two teams, a professional team and a university team. It is a joint and united football program though, and one structured unlike any other in Europe. It’s funded by the university, and the University is one of the highest regarded in Europe as well. So the foundation and resources are substantial. – Are you based on-site at the University? – Yes, most of our facilities are there. We have a turf practice field there, along with our meeting rooms and locker room. We do have some construction going on right now, so we practice about 10 minutes away currently— a very nice turf field nearby. Typically we can do everything at Koc though. – Is it a full-time job for you? – Absolutely. From the level I came from, I wouldn’t have come here unless I thought it’s a real football job. It has been a professional experience. – You’re a lucky guy! Most coaches in Europe receive little money for coaching. – I’ve been very fortunate, I know. – You’re not just the Head Coach, you’re the General Manager as well. What we know about General Managers in the NFL — they draft players, sign contracts, etc. Can you explain what you do as the Koc Rams General Manager? – Sure. We signed six import players — guys who are all professional players, that have played throughout the world in the top leagues. Not only Americans — 2 of them are Serbian. We have guys on our roster who were in NFL camps and in CFL tryouts. Some very good players, who played at a high level of NCAA football in the U.S. With import signings, it’s a definite marriage of talent and fit – as the general manager it’s my job to make sure that we’re exhaustive in our research, in our work. We have to bring in guys who are not only good players, but excellent culture fits. Whether it’s the football culture we want to create at Koc, or it’s a cultural fit in Turkey, I think, both elements are important. As a general manager, it’s my job to make sure that the people in our building are the types of people that fit. – Are all the import players professionals? Playing football is a full-time job for them then? – Correct. I think we pay free agents as well as anybody in Europe, it’s their full-time and only job. Their benefits and accommodations — all those things are handled for them here. They are professional players and we expect a professional approach and professional performance from them. That will always be the expectation and that’s what they have done so far. – Currently it’s your first season, right? – And it’s the first year the Rams qualified for Champions League , isn’t it? – Yes, it’s an exciting time for Koc. In addition to having both our Pro and University teams in the first division in Turkey, to coach in Champions League is a great honor and an exciting challenge. We are competing against good opponents every week right now. – Turkey is not your first place to work abroad. You also were a coach in Brazil and Canada. You’re a serious traveler! – That’s right, I am! For whatever reason I have always had that passion to travel. I am single, no kids… While I have this period in my life when I can travel and experience other cultures I try to do it. I have always felt that you’re rewarded for being bold. I never wanted to have an opportunity and not take a shot at it. Doesn’t mean you don’t sacrifice, I’ve lost some things along the way as well, but it’s still been a lot of fun. I never could have dreamed or imagined that football could take me to the places it has so far. It’s been an incredible journey. – So, what is football like in Brazil? – Brazilian football… It’s getting better. I would say it’s still behind the European structure certainly. There are tons of great Brazilian people who are passionate about it though. And they want to be great. Like many programs in Europe and Asia as well, Brazilian clubs are looking for funding, they are looking for options to make it sustainable. But Brazilian football is improving, I would say. It still has a long way to go, but there are people who want to make it great. – It is. It’s a professional league and obviously I was there initially for that purpose. 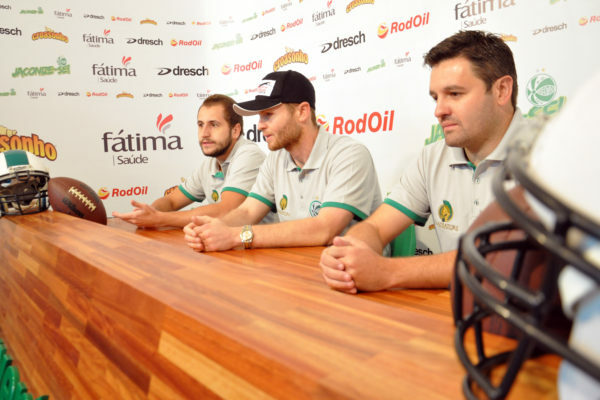 The NFL has invested in Brazil because of the growing interest in the league there. So, yes, it’s a good place for football. – Brazil is known as a soccer country..
– Definitely. Let me not confuse that, it’s surely a soccer country. I was there during World Cup, which was amazing… And it was a great environment there. I hope we helped to grow the game some, and the program I was working with is still growing and has really been successful this year. I’m excited about the future of football in Brazil. – I was there for 8 months. Most of the time in the South, but I was able to travel around quite a bit. Primarily I was running one team — Juventude. But we went to other places and helped to grow the game elsewhere as well. – Were you the head coach? – Head Coach and General Manager. Wearing both hats again. – Honestly, we didn’t do very well. It was an expansion team — a program that basically had just started. The guys tried hard, but we were not as good as we are now. – The Rams have been very good over time? – This team was doing pretty well in the regular season. There are some goals in the postseason they haven’t reached, so we are working on it. – Comparing Brazil and Turkey, what can you point out? – I think Turkish football is a little bit better in terms of its structure. Certainly our resources in terms of signing players are better. – Are there any other professional teams in Turkey? – There are, yes. Multiple teams in Turkey this year signed import players. Good players. Signings always help grow the game, when you have an influx of talent from the United States. Brazil was doing the same thing, probably even before Turkey did. But I’d say the average Turkish player is better than the average Brazilian player right now. Coaching wise, I know that a few Americans have been in Turkey coaching. A few also were in Brazil. It’s fairly similiar, but Turkey is a little bit better. – Finally, you’ve worked in Canada. We know that Canadian football is a bit different. What’s the difference, from the point of view of a coach? – You know, I get that question a ton from my coaching friends in the US. I think the modern CFL game is founded in NFL concepts that are adjusted to the uniqueness of the CFL rules. The best coaches there were the John Hufnagels, Marc Trestmans and a lot of other great coaches with NFL backgrounds. Talking about the uniqueness,— the wider field, different motion rules, 12 players, etc. There are a lot of really fascinating elements of the game that in a lot of ways make it a faster and smarter game. I know I felt the US game slowed down a ton after being there. In Canadian football there are a lot of moving pieces and it makes you think faster. I really like that and loved it there. – I have heard that the main difference between amateur and pro is the speed of decisions made on the field. Would you agree? – Yes, every level there’s a jump. Whether you’re in the US going from high school to college, college to Pro, or you’re going from a certain European league to a better league, there is always a speed adjustment for every player. 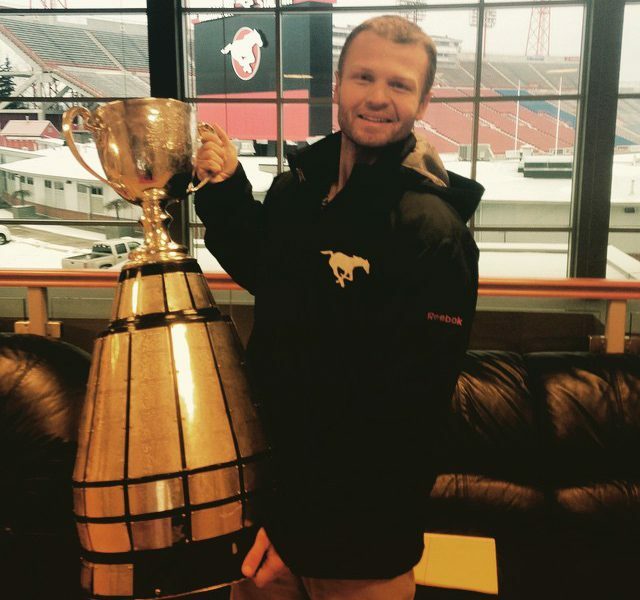 The CFL and NFL are clearly the top two tiers in professional football, and then there is a drop to what’s next. The speed of the game certainly is different. – I mean, it’s a surprise for me that according to your experience, CFL is faster. – Well, the athletes are excellent in both leagues. When you look at skill athletes in the CFL, they are NFL pedigree types. The imports at skill positions are high level players. I don’t think that there is as huge a drop-off between the CFL and NFL skill players as people think usually. The disparity in the leagues comes from the import structure in the CFL. You are forced to play Canadian’s at certain positions and that’s where it differentiates. – Are the necessary skills different? – At certain positions they are. As a receiver you get to play with more motion. The US guys go there and they don’t always know how to play with down motion, and that’s an adjustment. It’s different. For linemen there is a one-yard neutral zone. It’s a big difference when you don’t have a body on top of you right after the snap, or there’s a yard of grass before you start your pass rush plan . For Defensive Backs, when you have downhill motion at you, it’s a different deal. Some of the positions reduce. It’s three-down league, that makes it more passing. So, traditional heavy defensive tackles are obsolete in the CFL because they cannot rush. A lot of Defensive Ends from the US move inside and play Tackle. Safeties become Linebackers. It is a different game, but with many US principles. – I’ve read a lot about you as a QB coach. Is it your primary specialization? – Yes, I would say that every coach probably has an area that he is most associated with. That has probably been Quarterbacks for me — I’ve been fortunate to work with great people at that position. – Can you mention any notable quarterback you have worked with? – I was fortunate to be in a room alongside some great guys when I was in the CFL. Obviously, in addition to great coaches I worked with, we had great quarterbacks. Bo Levi Mitchell is a tremendous player right now. Drew Tate is one of the best guys I’ve been around. Kevin Glenn — long time CFL great player. Also, some guys who came in and out of there, who didn’t play there for very long, but still are really good: Ryan Perriloux, Tim Jenkins. I got lucky to be around some good people — certainly coach Dave Dickenson is a great guy I learned a lot from. There are a lot of guys in the college game right now with whom I worked with — John Wolford from Wake Forest, Carson Royal from Florida A&M and Luke Del Rio at the University of Florida are a few. Some more really outstanding young guys who will be big names soon too. So I’ve been around some pretty good ones and I tried basically not to screw them up — that was my goal :). – Why have you picked this specialization? – I played quarterback while growing up. At some point, they don’t want you anymore if you’re not a certain size or a certain ability. I thought I was pretty good, but my career as a quarterback ended earlier than I hoped. I still loved quarterback play though and was passionate about it. I learned a lot from great quarterback teachers. So, I kept kind of gravitating towards it and kept on finding myself in quarterback rooms. Over time, when you become a Head Coach, your scope tends to grow. And when you fall in love with the game, your scope just naturally grows. Quarterbacks is something I started with, but its grown to all aspects. – You have probably heard of George Whitfield and his methods, especially his drill with brooms? – Yes, coaches use multiple things to simulate pocket movement. I’ve done some work with it and I obviously see George as a prominent guy with that. I think, private quarterback coaching is an interesting field right now. Certainly, as I criticize it, I am the part of the problem, so I have to be mindful of that. But I think some of that coaching is for show. I don’t know that it’s really at the core of what a good quarterback is. But there is a place for implementing some of that. – He is getting criticized, but more and more players are working with him? – I don’t want to speak about anybody specifically, but there are certain guys who play on the business side of it. 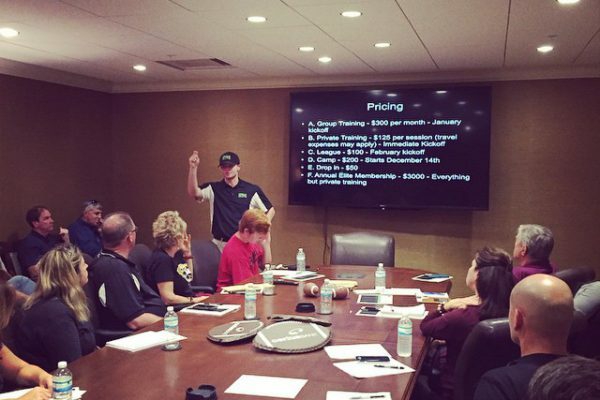 There is a self-promotion and branding element of private quarterback instruction unfortunately. You can take a look at Johnny Manziel right now. If you look back to Whitfield’s work with him — the blaring music at the Pro Day and coming out with an entourage, a lot of other things surrounded with that… I believe that type of guidance is counter-productive to what you want from a leader of your organization. Whitfield is a master of self-promotion, brander, it helps his career, but there is an over-saturation of private quarterback instruction in the US. There is no way to vet it either. You don’t need a license to be an instructor. If you can convince someone that you’re a guru, you are the guy. People have to be careful in terms of what they are getting. There are great quarterbacks who played the game at a high level and they have something to offer. Others like me, who didn’t have a great play career, had to work on our craft and make it a true skill. You have to make sure you’re not getting what is in between right now. I can talk all night about it, ha. – OK, George Whitfield is a broom guy. What’s your thing? – Interesting question. Opinions on Quarterback fundamentals are so curiously polarizing…mechanics, footwork, etc— everybody has a different opinion. I’d like to think that my approach is more holistic. A lot of guys in private quarterback instruction are just drill guys. Whitfield has said his job is to get players ready for there Pro day. I would hate to feel that I didn’t tutor the guy on how to play the game. I credit Dave Dickenson and John Hufnagel for showing me what that looks like. It’s big for me to come back and actually talk to a guy about how he plays with a plan, how to play the right way. That’s probably what separates me. …If you get even just a good player, a sustainable player at the position, somebody who solidifies you as quarterback for a period of time, there is really no price. – Speaking of QBs, many experts say that this quarterback class is not as good as last years, with Winston and Mariotta. Do you agree? – Last year was really pretty good. This group can be worse than that one and still be pretty good. I haven’t studied it like I did when I was scouting professionally, but from what I have seen, both Goff and Wentz are very good. However, there are a lot of things that dictate whether a guy will have a good career or not — more than just his ability. With Quarterbacks— your environment, surroundings, situation, all are critical. – … and just luck, maybe? You can always be drafted by Cleveland. – Exactly. You can be a great player, but at the same time — three coaches in three years, you are going to struggle. – Rams and Eagles traded up for quarterbacks this year. Los Angeles paid a lot to get the first pick and draft a new QB — is it worth it? – I think if you take a look at the history of trades like that, when teams paid heavy prices to get to the top, it typically doesn’t work out great. But I would say that if you get even just a good player, a sustainable player at the position, somebody who solidifies you at Quarterback for a period of time, there is really no price. Right now people are up in arms about the price, but if one of those guys comes in and stabilizes the position for 5 to 8 years, it’s well worth it. – Who is your favorite QB in NFL right now? Do you have one? – I do. I really like Drew Brees. The fact that he wasn’t a really tall guy, but found the way to play at that level, it’s incredible. He’s a really great competitor. Also, Aaron Rodgers needs to be mentioned in any conversation. He is the best thrower on the planet. – You’re from Jacksonville, right? Do you follow the Jaguars news? – Unfortunately (all my friends in Jacksonville will kill me for that joke). But I grew up bleeding teal. I loved the Jaguars as a child. Of course, we had incredible success in early seasons, but now is a tough period of time. Things are turning around a little bit though. They are a great example of the fact that regardless of what’s going on, if you don’t have the quarterback position set, you’re gonna struggle. Especially at that level. – So, what do you think of Blake Bortles? – Really good, I’ve been in there camp as a coaching and scouting guest there, so I’ve seen him up close and how he operates. He is a very impressive guy. Not only his physical traits, but his approach seems to be what you want. – Can he become a franchise QB for Jacksonville? – I like him, he certainly can be. Again, he’ll need good circumstances and he will have a chance. – The AFC South is getting much stronger this year. Titans are growing, Houston finally got a QB, Indy is still good. Do you expect a great battle in the upcoming season? – Getting back to your work here, what is most challenging? – When I came here, when I came to Brazil, the most challenging aspect was that the vast majority of the roster is not paid to play. At that point you are starting to deal with human motivation. Are they intrinsically motivated to be at practice all the time, be there on time? Are they taking care of their bodies like an athlete? When you have a large roster, you will inevitably have some guys who are not preparing at a professional standard. That’s a bit frustrating at times. Sometimes life comes up, people have other jobs, school is going on and they are getting away from football. The biggest jump football in Europe can make is finding a way to pay a minimum amount of money to some non-imports. It’s hard to hold the player accountable who is not being paid to play. But at the same time, if you don’t hold your players accountable, you can never grow. The people I pay, they practice regularly and improve. The teams in Germany pay not only Americans — they pay Europeans and that’s important. In any import structure, like the CFL and Europe, the best teams always have the best non-import players. There will always be Americans that you can go and get. But having the best local players and having them being accountable — that’s gonna be a big jump for football. – I’ve seen that you have your own academy called 904 Elite. Could you tell me about it? What’s 904, first of all? – 904 is the area code in Jacksonville, Florida. Football has given me way more than I’ll ever be able to repay. I wanted to find a way to give back somehow. 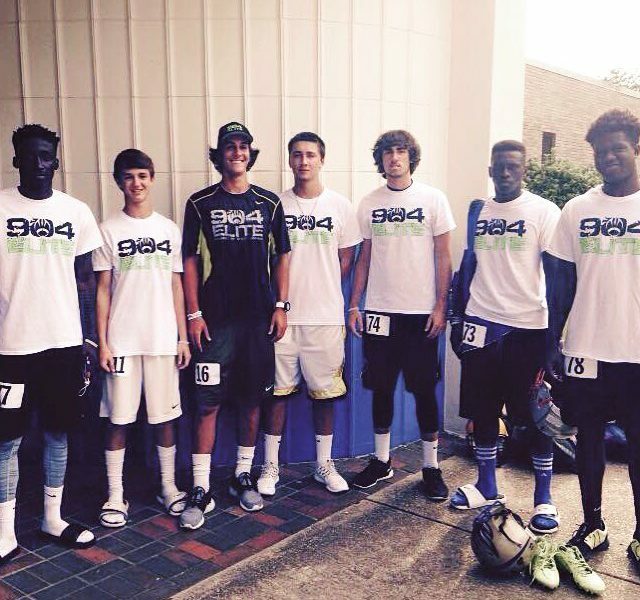 So, 904 Elite is a philanthropic project for me and a way to use football as a vessel to develop young student-athletes. Not only on the field — but in terms of there character, leadership, life skills and in instilling a desire in them to serve the community and give back as well. It’s been tough — I wasn’t able to give as much attention as I should due to my movements around the world, but I still have a vision for that. – Your story with Rams — is it a part of it? – I don’t know yet. I hope, maybe we will be able to find some kind of partnership. When I decided to travel and take some chances, see where the game takes me, it never left my mind to get back to Jacksonville. Jacksonville is still home. Every place I go, every person I meet, every conversation I have — I hope there is a connection to be made. To link some of those things together to help my city, that’s my goal.